Successfully Added Christmas Snowflake Yard Lights - Solar Powered to your Shopping Cart. Solar powered Christmas lawn and garden lights shaped in a beautiful snowflake design. As pictured, you receive 7 lights plus the solar charger. Provided in a kit that includes everything you need to decorate your lawn for the holiday. You simply unbox these beauties, quickly place them where you want, and then enjoy the festive lights! Is this baby's first Christmas? Are you the one hosting the family get together this year? Why not give everyone a special treat with these yard lights that are great to look at both day and night and at the same time easy to setup and takedown in a matter of minutes? The answer is here, this exclusive unique set of Christmas Snowflake lights. This is a perfect item for placement anywhere along a pathway, patio, or front lawn flower bed. Best of all, with Chinavasion's low wholesale prices and quick shipping policy, you can order now and your customer will receive their shipment in plenty of time for that big holiday landscaping project! 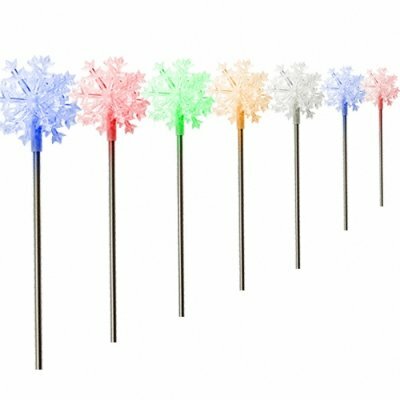 Colored Christmas Snowflake Lights for the lawn. No external wiring necessary. Place them where you want and enjoy the show! With these solar powered beauties you can forget your worries about running the electrical cord over the sidewalk and then tripping on it later! Having a lack of sun this winter? Just place three fully charged batteries in the power station to enjoy your light show. I think this idea and product are just great!